A Seamless Sweater. How to knit. To knit a seamless sweater is not a complicated project. But sometimes it can become a small nightmare if your gauge swatch does not match the one recommended in the description you choose to follow it. All of us are different. We can use exactly the same kind of yarn, the same size of knitting needles, but still can get different gauges. What is the solution? Should you change the needles? Now that's a bad idea. Sometimes it helps. But unfortunately it is not a universal solution. 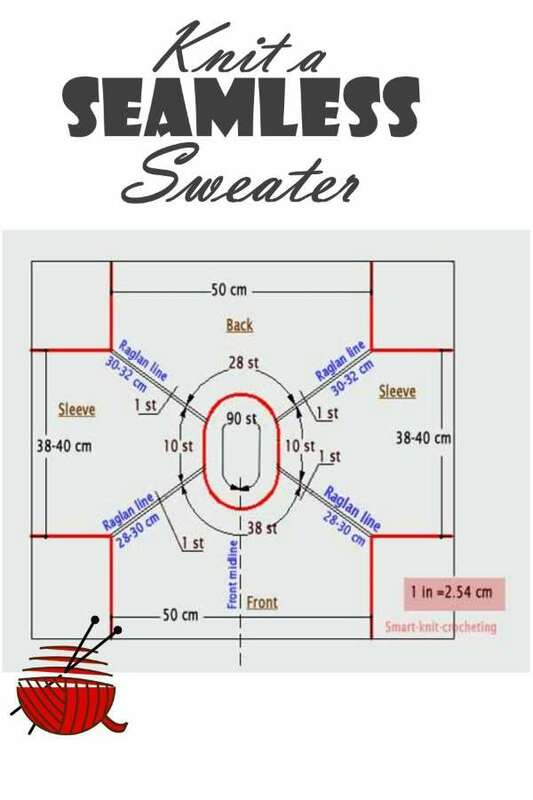 Meanwhile all those troubles are easy avoidable if you know the basics of the seamless sweater knitting pattern. Let's go step-by step through the process of making a seamless sweater pattern. All you need is to make a small sketch and to calculate the number of stitches required for your project. Seamless Sweater. Follow instruction step by step. 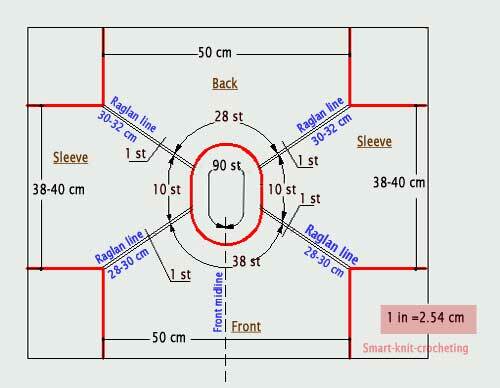 Place your measuring tape where you would like to have a neckline. If you plan to make a ribbing around, measure the neck circumference lower the desired neckline. For our example NC = 36 cm (14.2 in). Step 2. Make a gauge swatch. Use kind of yarn and a stitch pattern you've chosen for your project. Check explanation how to make a swatch at the Beginner Crochet page if necessary. For our example gauge is equal to 2.5 st/cm (6.35 st/in). Step 3. Calculate the number of stitches necessary to cast on. n = 36 cm x 2.5 st/cm = 90 st. n = 14.2 in x 6.35 st/in = 90.17 st (round to 90). Step 4. Distribute the stitches among the parts of the sweater. Back - 28 st, 2 sleeves - 2 x 14 st = 28 st, front - 28 st + 2st = 30 st. Step 5. Cast on, mark 4 raglan lines, work in short rows to make the front neckline deeper then the back. Row 1 and Row 2.Using any yarn cast on 90 stitches, make two rows in the stockinette stitch. These rows are auxiliary ones and will be eliminated in order to leave the loops of the next row opened - to make a neat looking edge or the collar for your sweater. Place the markers for the raglan lines according to your calculations. Don't connect in rounds yet! You will make a TURN after each short row. Row 3. Divide the stitches of each sleeve into 4 parts (just look at the picture while you are knitting): 2,2,3,3 stitches (see the picture) and stitches of the front into 6-8 parts: 2,2,2,2,3,3. Beginning from the front mid line knit: 1/2 of the front (19 st), yo, 1 stitch raglan line, yo, 10 stitches sleeve, yo, 1 stitch raglan line, yo, 28 stitches back, yo, 1 stitch raglan line, yo, 1/4 (3 stitches) of the next sleeve. TURN YOUR WORK. The stitches you did not knit are now on the right needle. Row 4. Purl stitches till you come to the second mark of the first sleeve (1 (purl yo) + 3 st) after raglan line between back and sleeve. TURN YOUR WORK. Row 5. 4 st sleeve, yo, 1 stitch raglan line, yo, 30 stitches back, yo, 1 stitch raglan line, yo, 7 st second sleeve. TURN YOUR WORK. Row 6. Purl stitches till you come to the 3d mark of the first sleeve. TURN YOUR WORK. Repeat short rows till you have on the right needle all parts of the both sleeves and both halves of the front joined. Begin working in the rounds. Step 6. Working sweater in the rounds. Connect into the circle the last row you made, to knit in the rounds. Make 1 YO before and after each raglan line every other row until your raglan lines are long enough. This way you will add 8 stitches in every other row. 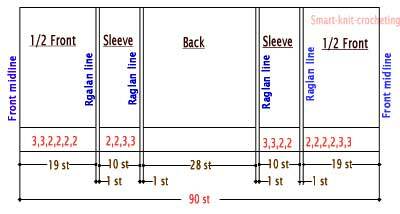 Check whether the sleeves and body fit your proper. Try to connect sides of a sleeve under your armpit. Do you feel comfortable when you connect sides of the back and front part? If you do, go to the next step. Otherwise, you have to continue to make increases till the seamless sweater fits proper. Step 7. Separate the body and sleeves. Work each part separately or in the rounds using either straight or circular knitting needles. If you want a closer fit at the waist line, change the needles to the smaller size. Step 8. Finish a neck line. Eliminate two auxiliary rows at the beginning of the neckline. Opened stitches of the first row place on the circular needles. Finish a neck line with a collar or proper edging. That's it about knitting a seamless sweater. The same technique can be used to knit a seamless dress, cardigan, and etc.